So the second part of my New York travels was something I was looking forward to trying. 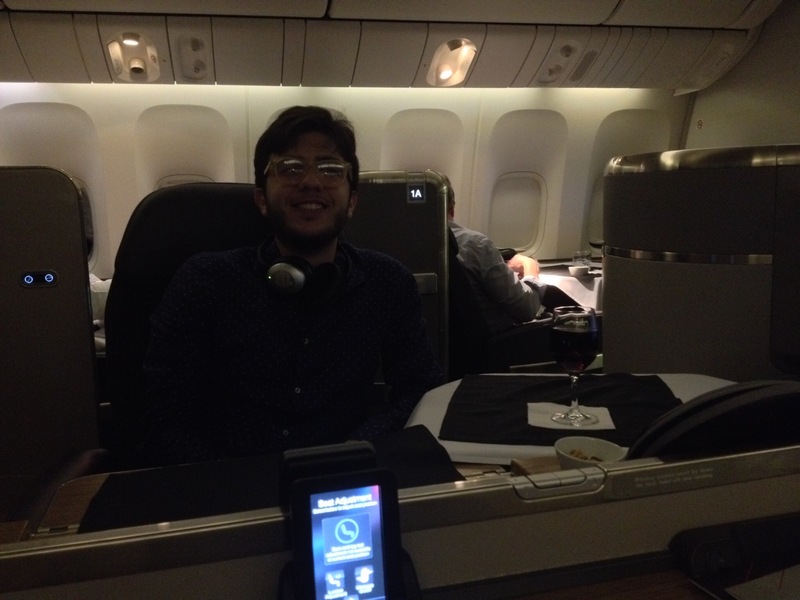 AA’s new international first on the 777-300 from JFK to GRU. This would be followed by a quick TAM flight back to GIG. For a few months before the flight I had secured a window and aisle seat. In the last couple of weeks before I got lucky and managed to secure the two middle seats. Normally I’d always want a window, especially due to the seat here, but when travelling with someone it is rather antisocial! I arrived at JFK quite early, dropped off the rental car and had a long train journey to the AA terminal. The first struggle came to find the Flagship First check in! Perhaps I was blind, but couldn’t see it so walked down to business to ask, only to find it was the opposite end of the terminal! Entering through a set of automatic doors, my first impressions were very good! Leagues ahead of the BA First check in area at Heathrow. There were a number of desks, with a porter to take the luggage. However only one was manned but with no queue. Check in was quick, our bags whisked away and through the door in to security. I wasn’t expecting this, but the first check in line went in to the TSA Pre Check. Being British, and having done no registration I didn’t realise I was eligible. My partner was not however…. After waiting while they served the main line, I was sent through but then he was whisked away to another area to queue again. Not very well handled!! I was expecting priority security sure, but to whisk someone away to another queue was a bit odd. Disappointing was my main thought. 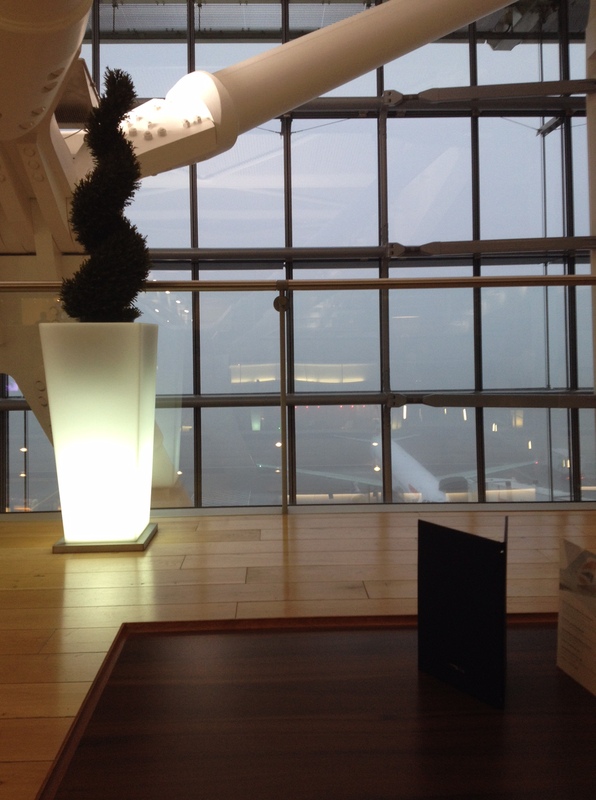 Certainly not a scratch on the Concorde Lounge at Heathrow or JFK…. It was busy, no comfortable chairs left (only those round a dining table we at first had to share with another couple), no waiter service, and no champagne! There was a hot buffet, and the food itself was ok but nothing special – similar to the BA Galleries lounge I’d say. The wine again was in a similar position. The showers were good though. With around 3 hours to kill at this point, and the miserable shopping selection at JFK not helping to pass any time, I was rather disappointed! I love lounges and was really hoping for more. I should have checked the standard Flagship lounge, but didn’t think. Finally it was time to board! The priority boarding line was short and orderly, and there was one bridge for both business and first. I think we caught the crew off guard as there was no one to show us to our seats so we made our own way. First impression of the cabin was good. Not very private, but it looked nice. The seats were comfortable, the screen decent. The novelty feature is the swivel chair. For take off and landing it points straight forward. For flight it angles in a few degrees which lets you recline and form the bed. But you can also turn inwards, or to face the window! This is how dinner was had! Seated either side, in one of the seats I had reserved to start was a Brazilian couple who asked if we could swap. We said no, as I spent weeks of daily checks to secure two middle seats. The wife did not look happy and made Steve’s life difficult insisting on sitting next to her husband. The husband…. He seemed relieved!! Some champagne helped to soothe things over, in plastic glasses…. Come on AA! The wash bag is somewhat… Well it’s a tablet sleeve! And the toiletries inside were only AA branded, nothing ‘special’, especially for first. We asked for dinner as soon as possible in to the flight as it was a 10pm take off. And turned the seats to face inwards. There was a lot of table space from the main pull out table and the flip out central table. There is a hot seat, but as the TV position is static, I think it would have been very uncomfortable to use! The dessert sundae was great though, even better than the way out on business. In the morning, I had the American Breakfast, which was quite disappointing. 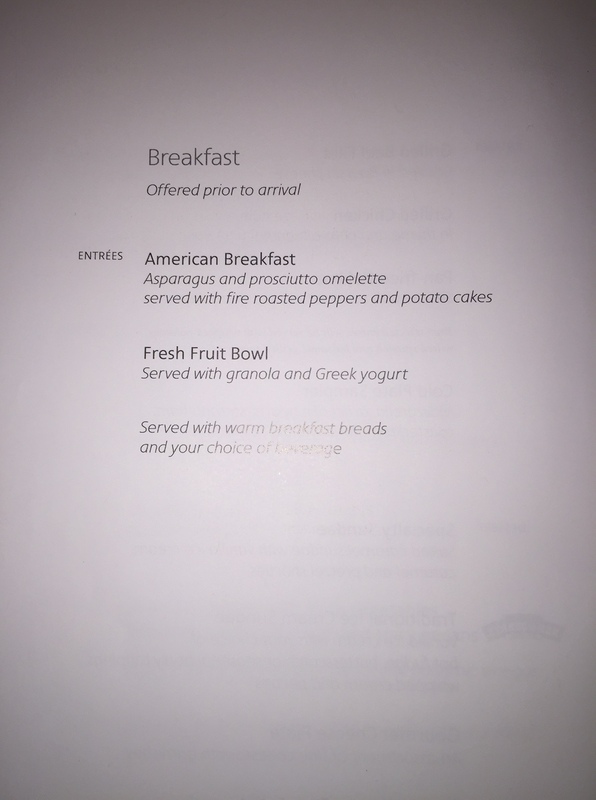 I would have hoped for pancakes, bacon and maple syrup, muffins, perhaps eggs benedict… But a flat and flaccid omelette was served as the ‘American Breakfast’. The bread selection was also poor, with something that was certainly pushing the definition of a croissant. Speaking of business class though, I popped back to look at it. The new AA business looks fantastic! Reverse herring bone, very private, spacious… I actually paid less for my first ticket than business cost on the same flight, but in normal pricing, it could be hard to justify… Especially as first is less private if that is an important consideration! Now the service from the two crew was great. Steve especially was very friendly and made sure our glasses were refilled. I feel they have a good hard product to work with, but are let down by the menus and wine selections. Otherwise this could have been a truly great first class flight I think. I think it was one of the best sleeps I’d had on a plane, as after dinner I requested my bed be turned down, went to put on my (not 100% cotton but soft) pyjamas and was out like a light until breakfast! Deplaning first made GRU’s immigration pretty easy (it can be awful!). Bags were out quickly too, as we had to clear customs and recheck (I believe always in GRU). Then a shop…. With crazy queues. After some tricky navigating, bag recheck for TAM was straight after, and we were issued updating boarding passes showing the gate. Then the tricky bit… Our boarding pass only had a gate, not a terminal… After asking lots of people, and navigating through the unsigned maze we ended up at T2. Asking where the lounge was, I was told there were two lounges, one before and one after security. 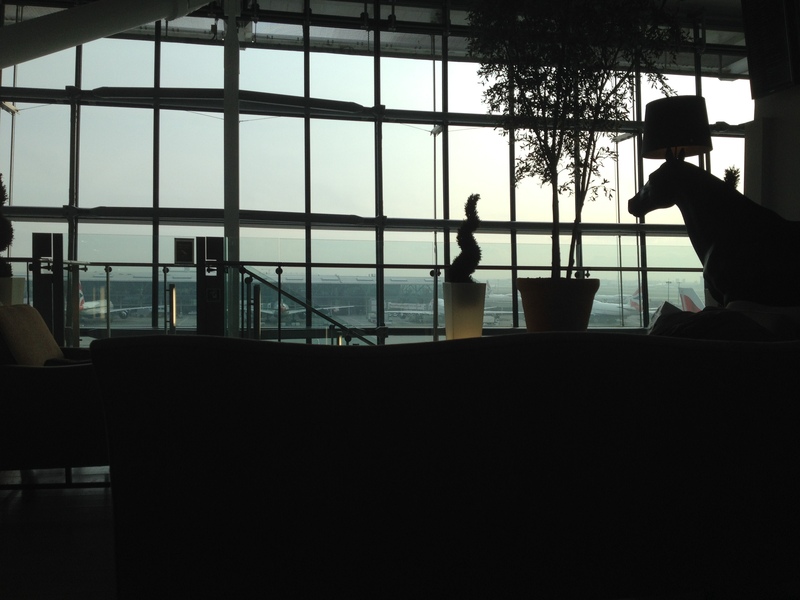 Now the worst bit… There is no lounge after security… T2 is split in to two wings, and the domestic wing has no lounge. Not good!! 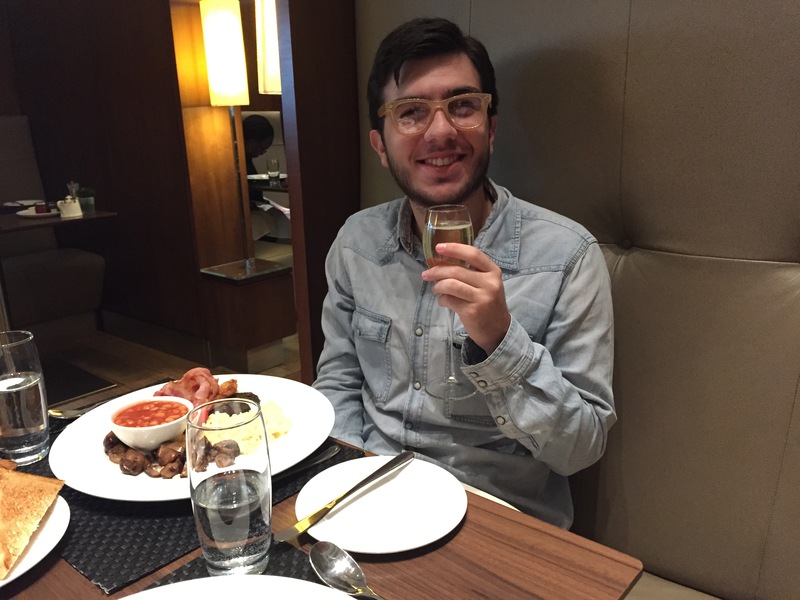 A two hour wait with no lounge, no shops and uncomfortable chairs… I since discovered There is an Amex Centurion lounge before security open to Platinum holders. Nothing great, but better! But one final surprise – a change of plane meant we had a long haul 767 instead of the normal A320, and a business class angled flat seat. It taught me not to consider TAM business to the UK unless it is dirt cheap! Not the comfiest seat, and too short for me. There was an uncomfortable hard part that would dig in to my side when I lay down. But still it was better than the expected shuttle service plane. So… picking up from the last post! Sometimes there is a bit of chaos at the gate I’ve found… and this was about the most chaotic ever… with no announcement to board there was a huge queue of people, half of them at the Fast Track lane. After a couple of minutes they announced boarding would start, but a huge throng of people started towards the fast track queue… I slowly managed to edge through the crowds of waiting people who were being told not to queue yet, to find a nice arguement starting on a guy who was in Premium Economy and insisting he should be allowed Fast Track. It turns out, despite the seeming throngs of people, no one was actually supposed to be in the fast track lane yet… We were the first in to the First cabin, today with two boarding air bridges, with a dedicated one for First. The Rio flight is operated by a 777-300. 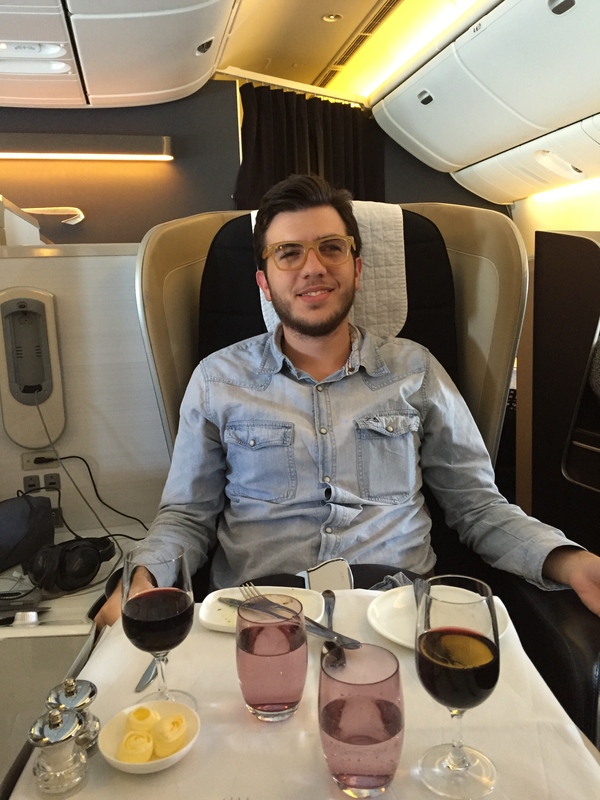 On all the BA First cabins, there are 14 seats, but some slightly different arrangements. This is 1-2-1, with an extra two seats on the window sides to the middle. 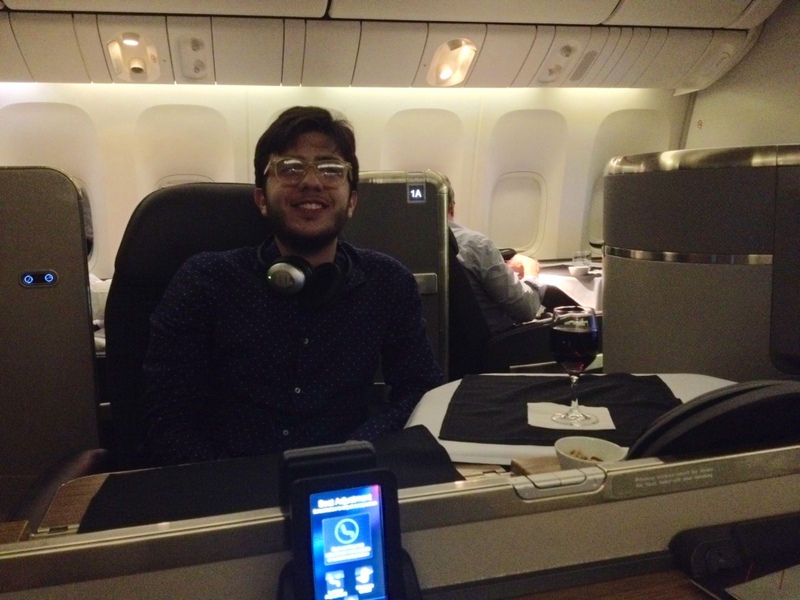 We were shown to our seats and home for the next 10.5 – 11 hours by Nick, having selected the two center seats. I’d never travelled in the centre before, always taking the window seat. Certainly if travelling by yourself this is the better pick. Travelling together, the centre seats allow conversation, but still a good degree of separation. Of course each seat does have the hot seat opposite, so you can die together sitting opposite each other. The BA First seat is a lot more simple than some. Instead of a control panel with various buttons, there is a single dial you twist. One way the seat relaxes, eventually turning in to a full flat bed, the other way is more upright. There’s a button to put it back to landing position, and two to adjust the lumbar support. There’s two lighting options – a small light in the ‘suite’ which you can turn on and dim, and two overheads, medium and strong light for lack of a better term! The IFE screen folds back, so no watching during take off or landing. It is also quite hard to open and close sometimes! It’s an ok size at 15″, and isn’t too far away from you either. The controls are in a small handset on the side of the seat (in a small cupboard when by the window), and touchscreen. The hot seat pulls down (well, part of it) to make a foot rest at a lower hight, which is more comfortable for most positions. Storage space is not much though. There is a private closest, which is enough to hang a jacket, shirt and trousers in when changed in to the pyjamas, as well as a pair of shoes at the bottom. That is it though… There is an overhead bin for carry on, unlike some other airlines. But around the seat itself though, there is no storage, other than a small magazine pouch not big enough for a book really, but ok for an iPad or Kindle. By the window, the small table is raised out the side, which does give some space behind to stow some things. In the centre it is slightly different, and there is more flat space there, but no where to secure things from sliding forwards. There are the usual selection of USB port, multi-country mains socket, and a video in if you happen to have composite video out… not met anyone who does yet! While the plane was boarding another 5 people joined in the First cabin, meaning half the seats were full. We were served some of the very nice Grand Siècle as we had in the lounge, as well as some hot nuts. The wash bags and pyjamas were distributed as well. I do like BA pyjamas – I have eight pairs now, and wear them all the time! The washbag has some ok products (lip balm, moisturiser, eye gel, toothbrush, hairbrush, deodorant), but I do prefer the previous bag to the current one, which feels a bit cheaper and is quite small to be useful as a regular travel bag, unlike the previous one. 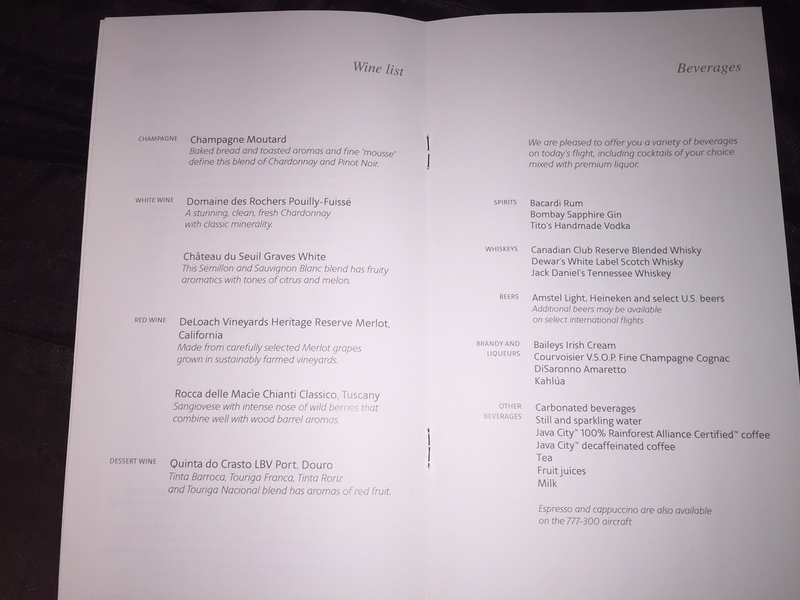 The menu was distributed shortly after take off by the Cabin Service Manager, who also had a brief chat with all the passengers, and of course knows everyone’s name. You can dine at your leisure in First, and we decided to dine together at around 3pm (we took off at 1). The highest priority is of course the wine list! This gave us an hour and a half or so for a movie, and I watched Big Hero 6. I’m just a kid at heart! Loved it!! And a couple of glasses of the pinot noir. 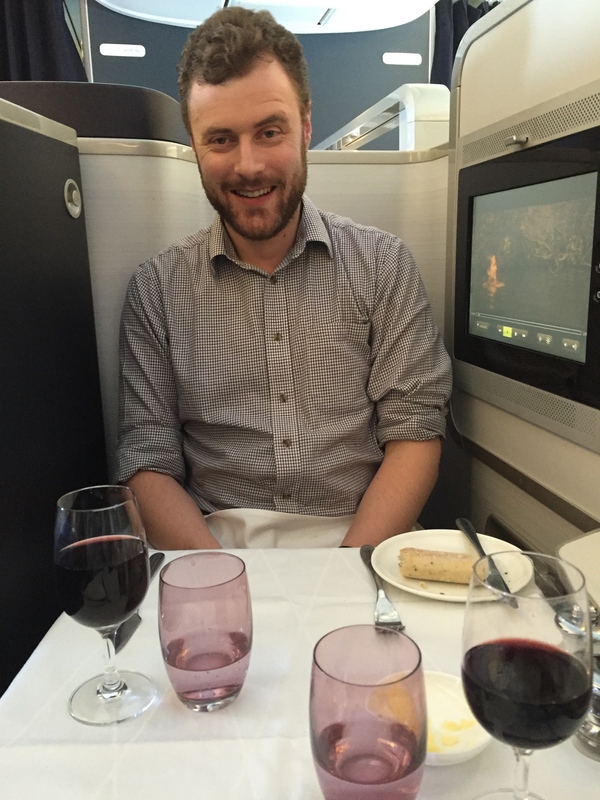 I can’t for the life of me remember what the Amuse Bouche was on this flight… but I don’t think I liked it much! My starter was the ham hock and chicken terrine, which was pretty nice. Normally I have a soup, but there wasn’t an option. For my main I went away from my usual steak option, and went (Shock horror) for the Twice Baked Gruyere and Parmesan Souffle. And it was delicious I must say. Matched with a lovely glass of the bordeaux wine, Chateau Haut-Bergey 2004. The chocolate fondant for dessert was quite divine, one of the best plane deserts I’ve had in a while. 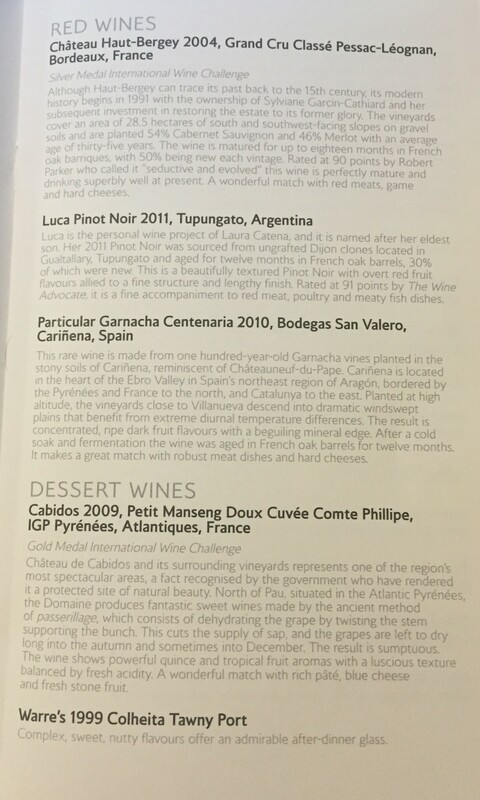 For this I had a class of the Cabidos dessert wine, which has been on my last couple of flights. They used to serve a Tokaji , which I preferred, but it is still very nice. This was my first time dining together, and it quite an interesting experience being able to sit together like at a real restaurant! The hot seat isn’t the most comfortable in the world, but it is serviceable for a couple of hours, no worse than a simple chair in a restaurant anyway! As luck would have it, as it was coffee time the seatbelt sign came on, which means no hot drinks. It was only for about 15 miniutes, at which time my espresso arrived, and I returned back to my seat for a bit to finish the movie, and to start another. As it was a dayflight, I wasn’t particularly tired at this point, alternating between watching, reading and drinking! I’m one to talk to the cabin crew if they are receptive, and on this flight I probably had a good one hour chat with the steward looking after my side of the First cabin. At this point I had the bed made up, got changed to the pyjamas and slept most of the rest of the flight. I didn’t bother with the light lunch, still feeling fairly satisfied after dinner and taking an opportunity to get some rest. All in all a great flight, one of my better experiences on First… although I did miss the window… I think the electric blind is fantastic!